Assume all waterways are infected. Inspect, remove, wash and dry will help reduce the risk of spreading pathogens and invasive species. Please make sure you wash and dry your equipment when traveling between different water courses to help stop the spread of invasive species. Every time you leave a watercourse. Please inspect your boat for vegetation or living creatures and remove any that you find. For further information on gear washing check out. Rinse and disinfect all gear thoroughly this should be followed by a 48 hour drying period. Milton can be used as a disinfectant, either make a solution or a spray or by washing gear in water over 40 degrees. Disinfecting kayaks/canoes/paddles with (Virkon / Milton Solution or power hose with hot water over 60 degrees Celsius this should be followed by a 48 hour drying period. For anyone travelling to compete in any Canoeing Ireland competition or event, please wash and dry your gear before competing and make use of wash stations at events before you leave. For more information on the Crayfish Plague and invasive species in general. For more information on the Crayfish Plague. Canoeing Ireland recommends that canoeists endeavour to adhere to the below Code of Conduct to maintain good relationships with land owners and other water users. Special consideration needs to be given to the impact of canoeing on the natural environment and other water users. Minimise your impact on the natural environment at all times particularly make efforts to reduce river bank erosion at access and egress points. Take only pictures and leave only ripples. Leave no mark of your passing, leave no rubbish behind and whenever possible pick up any rubbish you see along the way. Be sensitive when parking, changing, entering and exiting the water. Observe wildlife from a distance. Do not follow or approach. Avoid wildlife during sensitive times: mating, nesting, raising young, or winter. Maintain positive, co-operative relationships with other water users and riparian landowners as this is important for the future of canoeing and the future of canoeing environments themselves. At entry and egress points behave in a friendly, positive manner towards owners. Be mindful of the time you are spending occupying the launch or take-out area and that you do not unfairly restrict opportunities for others. Most canoeing activity in Ireland takes place on rivers over the winter, however there is growing activity in the summer and early autumn when angling reaches its peak. Canoeists should watch out for anglers, pulling in out of the flow and respectfully making anglers aware of their presence until receiving a signal that it is convenient to proceed. Showing this courtesy to fellow river users will prevent the anglers day being ruined and avoid the risk of injury through a paddler being hooked or an angler bumped by a boat. The following is a brief summary of the current legal position in relation to land and river ownership and access. When a river flows across land, no one owns the water. However, if a single landowner owns the land on both sides of a section of river, that landowner owns the bed of that section of the river and the airspace through which the river flows. The landowner can prevent trespass on a river the same as if somebody was walking across their land. The trespasser can be asked to leave by the nearest convenient route or whatever is considered convenient in the eye of the landowner. Reasonable force is permitted. It gets a fraction more complicated where there is a different landowner on each bank. In that case it is presumes that the boundary between them is mid-river. However, each riverbank owner (legally termed the “Riparian Owner”) has the right to wander about the river as far as the other bank. This riparian right of navigation is even more important when the river widens into a lake. In the situation of a lake, it is assumed that the riparian owners own the lake in wedges and all of the riparian owners have the right to wander about on all of the lake. However, the riparian right of navigation is a separate legal property right and it is possible to divorced it from the riparian land ownership. It is perfectly possible for two land owners to come to a deal together that effectively transfers the boundary to the one riverbank. That might happen in a case where one owner is anxious to have control of the fishing or the right to water cattle or perhaps construct a water powered mill or whatever. It might suit a landowner to pay the other land owner to give up their rights to the river, switch the boundary to the other side of the river and prevent that landowner from having any access to or rights with regard to the river. 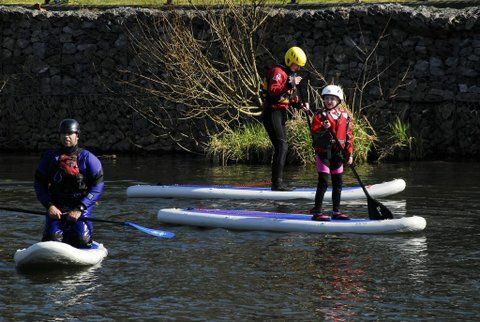 There was for instance an important case about 20years ago in which a water sports service provider bought a side on the banks of a lake in Connemara and set about canoeing all over the lake. From first principles he would have been OK, but it was proved by a strong documentary and other evidence in court that all the other landowners bordering the lake had been bought out by a landowner on the other side of the lake. This invested the riparian right of navigation for the vast majority of the lake to this owner who subsequently developed the lake as a commercial fishery. The equivalent of a public right of way on land is the public right of navigation. Historically, rights of navigation are based on commercial need and recreational navigation has followed more recently. As with land situations, public rights of way can and have been established, but this really only applies to the bigger rivers such as the Barrow. Many of the larger rivers are controlled by legislation and certainly the power producing rivers such as the Erne, Liffey (including Blessington Lakes) and the Shannon have their navigation controlled by the ESB under specific once off pieces of legislation passed by Dail Eireann. From the perspective of the canoeist, it does not matter where you get on the river. Once you enter into private property you enter private property and if on a particular river, the land on both sides is owned by the same individual, then that individual has the right to stop you canoeing down that section of river in the same way as that owner has the right to stop people walking across their fields. A landowner who only owns the land on one side of the river cannot really stop canoeing down the river except with the co-operation of the land owner on the other side. Delphi Fisheries own the riparian rights on both sides of the Bundorragh River from Delphi Bridge down river and as such have a legal right to prevent trespass on the section of river it owns. It exercises this right during the fishing and spawning seasons but chooses to allow canoeists use the river at other times of the year. It is assumed the same applies to the Caragh and Erriff. You cannot trespass on a river is requested not to by its owner. If you persist in trespassing after being requested not to by the owner or their agent you are breaking the law. Establishing exactly who the owner of a section of river is crucial as it is only the owner who has the legal right to prevent trespass. If you have permission to access a river across private land and have permission from the landowner of a section of river then you have the law on your side to paddle that section of river.